ANNAPOLIS, MD (September 20, 2012) – Many people have fond memories of raising some sort of classroom “pet,” be it butterflies, frogs, fish, hermit crabs, or “regular” pets like hamsters or gerbils. Watching a plant or animal go through its entire lifecycle is incredibly fascinating and can be an invaluable experience for a child who is just getting excited about learning. But what is growing in your classroom? Are you learning about a native species, or a foreign one? And when you’re done with your classroom pet or project, what happens? Ideally (perhaps to the surprise of some), these organisms should either be kept by students or teachers, or humanely disposed of. What many people don’t realize is that many of the species grown in classrooms, while great for education, are bad for our Maryland ecosystem. If the species does not occur naturally, and it proliferates in the wild (as so many do), it can do great harm to the naturally occurring flora and fauna. These organisms pose special risks because the people caring for them (simply by being students and their teachers) are often not as knowledgeable about the organisms as they could be, and not prepared for the long term (i.e., the organism’s lifespan). Release into the wild after a stint in a classroom is all too common. For this reason, classroom organisms have been chosen as the Invader of the Month. If you were to think about the pets one might raise in a classroom, what comes to mind? Butterflies are probably your first thought. Many a class has raised a caterpillar and watched it turn into a chrysalis and then a beautiful butterfly when learning about the life cycle. In Maryland, we of course have lots of beautiful native butterflies. In fact, our state insect is the Baltimore Checker-Spot butterfly. Unfortunately this species of Maryland fauna is now fairly rare. Other natives include the monarch, the red admiral, many types of swallowtails, etc. In classroom projects, the most common butterfly to raise is the Painted Lady. This is also a native species, and is an example of something that could be safe to release into the wild. But butterflies like the Cabbage White, originally from Europe, are actually invasive, and should be avoided. Goldfish are another common classroom pet (and are also something commonly won at fairs, by children). Those who do not want to care for them often release them into backyard ponds, lakes, and streams, where they usually thrive, as goldfish are a hardy, coldwater species of carp. We have carp here—but not this kind! Goldfish can grow to extremely large sizes given space and food. In fact, outgrowing a tank is often the reason people release them. Given a wide open pond with plenty of smaller things to eat, they can quickly take over. Frogs are another example of this idea; if you get tadpoles, children can watch the frog slowly but surely come into its own and reach adulthood. It’s natural, after that, to want to release it and allow it to thrive as an adult. 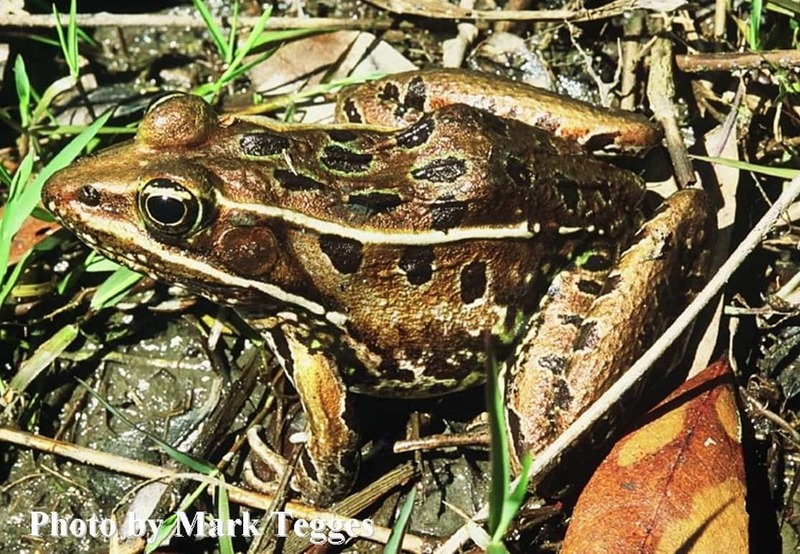 But know what you grow; non-native frogs are incredibly dangerous to an ecosystem. Imagine if someone were to release African Clawed frogs (common in gift stores) into a stream or lake—this particular frog can grow to 5 inches and is voraciously carnivorous. You might be surprised by the kind of animals you could find in classrooms, too. I know a girl who has a pet tarantula that used to be a class pet—no tarantulas are native to Maryland, so this was the perfect “final destination” for that arachnid. People also keep stickbugs, which are awesome classroom pets, but many species of them are also parthenogenic, and could be absolutely devastating to an ecosystem if not properly contained. Even the waste from these insects has to be properly disposed of, because it could contain eggs (freeze it for a few days before throwing it out). It’s not only animals from classrooms that can be a problem, of course. Plants are some of the worst invaders. They can spread with alarming rapidity, especially water plants. Plants such as the anacharis (elodea)-like hydrilla are popular in classrooms to use under the microscope, because they have such easily seen cells in their leaves. They are also popular in aquariums; so put your plants to use there after you’re done in the classroom, instead of in the wild! Anyone that has had anacharis in their aquarium knows how fast it can grow. Anacharis is native to North America, but hydrilla is not, and many lakes across the country are having huge problems with the spread of this water weed. Perhaps one of the coolest, and most dangerous, classroom projects is a mini ecosystem, or terrarium. Often these have multiple organisms in them—snails on the land portion, a goldfish or guppy in the water, an aquatic plant for the fish, etc, a perfect storm. I’ve already mentioned the dangers of invasive fish and plants. Gerbils are an active, social and interesting classroom pet. They are omnivorous, hardy and are perfect invaders. In fact, California bans possession of gerbils for fear that they would establish themselves in agricultural fields. Keep, don’t release! Whether it’s something you acquired from school or the fair, keep it or rehome it, but don’t release it into the wild. Past science projects can make fascinating pets. If you can’t keep it, humanely dispose of it rather than release it. It’s better than disrupting our Maryland ecosystem. Most plants and insects can be safely and easily disposed of by freezing. Or you can find someone who would appreciate a new pet to care for and love. But whatever you do, don’t release non-native species into Maryland’s ecosystem. It’s not doing anyone (or anything) any favors. For more information about Invasive Species of Concern in Maryland, visit the Maryland Invasive Species Council﻿. ﻿photos available electronically on request. Invader of the Month insects, other invertebrates, vertebrates. permalink.